Circle above the Grand Canyon’s remarkable South Rim on a full-day air and ground tour from North Las Vegas Airport. Soar above the Las Vegas Valley and Lake Mead’s undulating shoreline and take in an awesome aerial view of the Hoover Dam before touching down in the National Park. 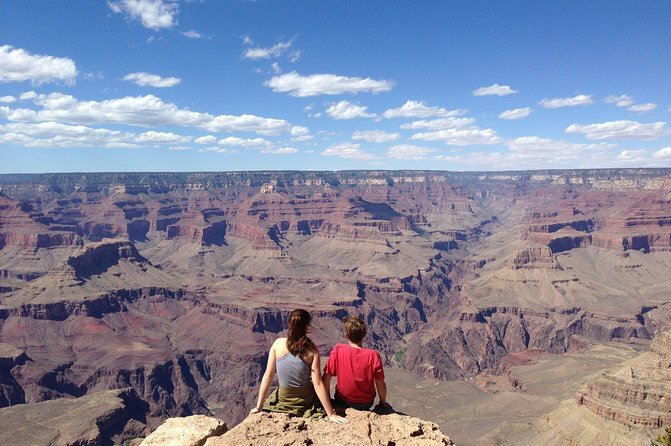 Visit the canyon’s most iconic viewpoints on a 3-hour guided bus tour along the South Rim. Stretch out and capture the scenery at frequent stops, then return to the airstrip for a return flight to Las Vegas. This Grand Canyon adventure starts with a complimentary Las Vegas hotel pickup and transportation to the North Las Vegas Airport near Downtown Las Vegas for flight check in. Grab a coffee, sandwich, or snack (own expense) from the onsite store before boarding a Dornier 228 turboprop aircraft. While settling into a comfortable window seat, the flight begins with views of the Las Vegas Valley. Fly by the Las Vegas Motor Speedway and over Nellis Air Force Base, then continue on past Lake Las Vegas, home to many Las Vegas celebrity entertainers. Next, fly by the Hoover Dam. Have a camera ready for the perfect photo opportunity of this landmark icon. Then, fly over parts of the Grand Canyon, allowing for a bird's-eye view of this vast natural wonder. Flight time is approximately one hour. Upon arrival at the Grand Canyon South Rim, travel to the park for a walk along the canyon's rims and enjoy the stunning views. Stroll along parts of the Bright Angel Trail and do some local shopping. After a box lunch break, visit Mather Point, which boasts some of the most impressive panoramic views in the entire Grand Canyon. Grand Canyon National Park is home to an abundance of wild animals, so the chances of seeing deer, elk, squirrels, or California condor in their natural environment during the tour are good. The driver/guide will share the park's rich history and other knowledge while journeying through the park. After visiting the park, board the airplane for a 1-hour return flight to Las Vegas.